US Federal Reserve hiked the Federal Funds rate to 2.25% to 2.50% as expected, but in the press conference afterwards, chairman Jerome Powell suggested further hikes were likely in 2019. PM Theresa May delayed a House of Commons vote on the EU Withdrawal Bill when it became apparent the vote would fail – the key terms will be debated during January 2019. 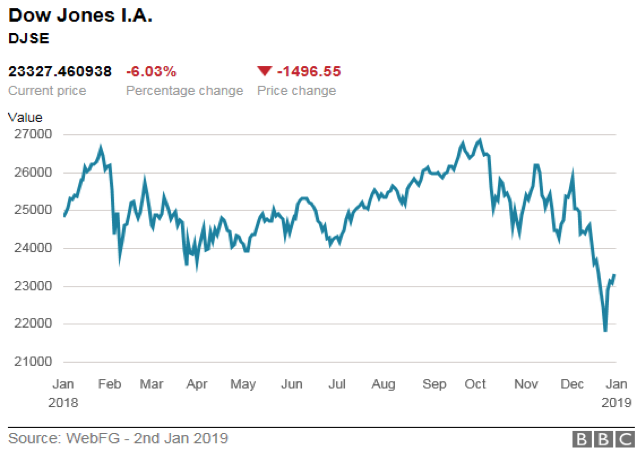 Global equities ended a torrid 2018, with indices off sharply, UK blue chips fell 12%, Tokyo dropped 14.9%, the Dow was off 6% whilst the Shanghai Composite endured a 21.6% drop. For many indices, the declines were the sharpest since 2008. 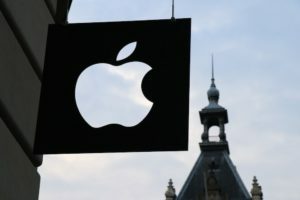 Apple Inc ended 2018 at $157.85 per share a drop of 32.4% from highs of $233.47 per share in August, bogged down by iPhone growth concerns. President Trump said the US government will remain shutdown until the US Congress agrees to fund the controversial US-Mexico border wall. ASOS lowered its 2019 guidance it now expects EBIT of 2%, half its previous operating margin. The board cited very tough trading conditions. US crude oil ended near 2018 lows reached on Christmas Eve of $42.53/ barrel having declined 44% from highs of US$75.96/ barrel on 3rd October. HMV entered administration for the second time on 28th December 2018 after poor trading in the pre-Xmas period. London started 2018 at high valuations, and got carried away in January and May before a big re-pricing that took UK equities down 12% the year. Whilst “Brexit” is an unresolved drag on the desirability of UK assets, the PM’s very weak grip on government has become apparent. Over 2018 the disastrous 2017 General election was the chicken that came home to roost for PM Theresa May. With only 3 months left until Brexit, we remain hopeful that clarity will be restored. 2018 saw numerous closures as online shopping picked up market share at the expense of the High Street. Once revered names like House of Fraser, New Look, Maplin, Toys R Us all bit the dust. The UK commercial property sector is under pressure from CVA orders, overcapacity and Brexit relocations. But even the online market is more crowded as ASOS margins confirmed. M&A activity remained strong, we said goodbye to Sky, Randgold Resources and Shire Pharmaceuticals. We are hopeful that the synergies from combining Wal Mart and Sainsbury are achievable. 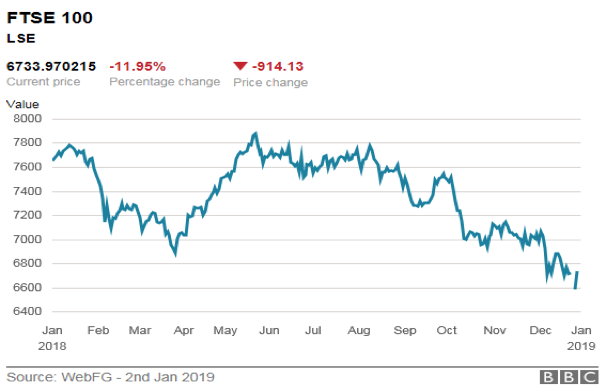 The Tokyo market came unstuck over December losing heart after trading sideways for most of 2018, delivering a kicking for investors. The Yen’s strength has hit exporters, but it is primarily US trade war issues hitting sentiment. Japan’s high public and corporate debt makes it vulnerable to global rate hikes. Still, the near 15% drop was Tokyo’s worst year since 2008. 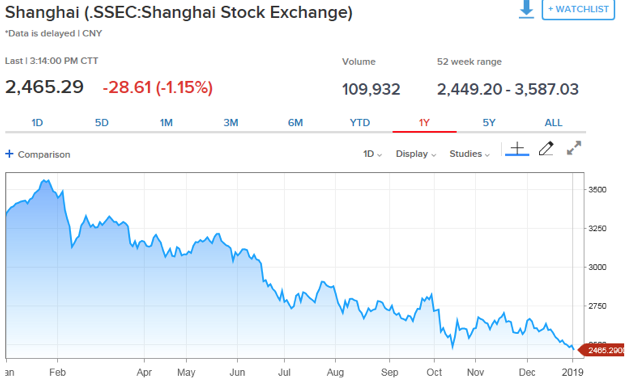 Shanghai equities, a firm bear market limped out 2018 in weak shape. The leadership is unwilling to cave into US demands on trade, however will likely use the pause period to negotiate. Under pressure from the “gillets jaunes” President Macron reversed plans for tax hikes on fuel, overtime pay and low income pensioners, and hiked the minimum wage by €100 per month. The move bought off the protest movement after two weeks of demonstrations in central Paris. The “gillets jaune” movement was curious in that it was not led by a specific individual, and appeared and disappeared in a spontaneous fashion. The emergence of mass demonstrations blocking political reforms is nothing new in France. However social tensions appear more prevalent and this is very negative for France’s young leader, whose centrist positioning is important for the EU project. Also positive was the approval of the 2019 Italian budget, a day ahead of the deadline. The Italian government agreed to lower the 2019 deficit target to 2.04% from 2.4% as well as cutting spending on election pledges. Rome also lowered its GDP outlook to 1% from 1.5%. The move appeared to work with a government auction of 10 year notes seeing higher demand. EU equities sustained higher losses over 2018 than US equities but lower than Asia. The European Commission expects the EU27 to grow by 1.9% in 2020 notwithstanding the negative impact from Brexit (-0.2%) on the EU. 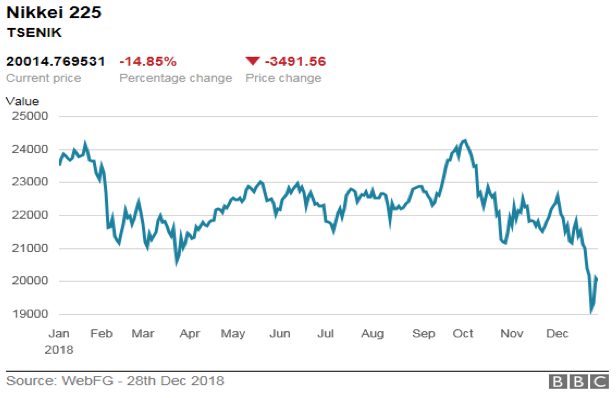 December 2018 was a tough month, a sort of grand finale to the steady drops for most of 2018 – December saw US equities catch up with global market declines. US investors got talked into the story that the US Federal Reserve would signal it was near to a neutral rate, however this hope was dashed. The Federal Reserve said “monetary policy at this point does not need to be accommodative”, it will stick to its planned rate hikes and the sell-off of balance sheet assets would continue “on autopilot” at $50bn per month. Whilst observers might blame Jerome Powell’s press conference, others the realization of slowing global GDP growth and the slow tyre puncture of the falling FAANGs – a creeping issue is the “end of cycle” problem, the US expansion has lasted 10 years now, and rate hikes are likely to slow US GDP growth in 2019. It is evidently a tired expansion. Rate hikes have lifted the US dollar’s external value, depressing overseas earnings and pose a risk for a number of emerging markets over 2019.